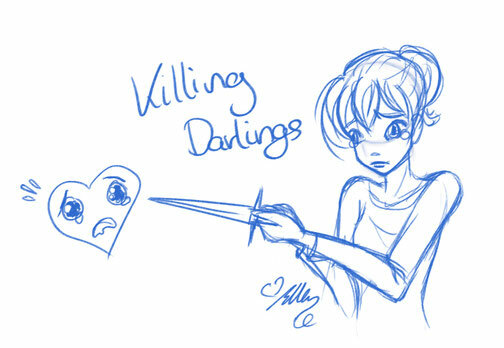 One of the hardest things to do is "Killing your darlings". It's a common practice among writers and refers to the cutting out of ideas that you liked very much but just don't have any purpose or influence on the main plot. I've had to kill some darlings in my time and, naturally I have to do it for the Sovereigns comics occasionally, too. For example: the first issue was supposed to start with a nightmare scene of Hay Lin that I was very fond of. Now this is a temporary kill since I might still use the scene in a later issue but for the first one, I had to "kill" it. A much bigger decision awaited me yesterday. There I had to decide whether to kill an entire comic arc. I took some time off yesterday to clean up all my documents concerning the comic, sort the ideas and structure them. I also wrote down the second arc in detail to see how it worked and... well it just didn't. The theme of the villain resembled another Arc a lot, which was the first thing I tripped over. Taking a closer look, I noticed that the arc consisted almost entirely of a magical mission which had NO effect whatsoever on WITCH's normal life or the following arcs. It felt really weird killing an entire Arc. I mean... an entire Arc! That's like a whole bunch of documents, pictures, characters, etc.! But it was the right decision. RIP Arc 02! You were a marvellous idea and I shall never forget you! Actually, now that it's no longer part of WITCH Sovereigns, the idea can breathe and develop its full potential, since I shortened it quite a bit to fit the comic. Arc 03 shall take it's place and become the new Arc 02. Did you ever have to kill an idea you really loved?